Storage is the hot topic throughout the solar industry. More and more manufacturers and distributors are coming online with all the components, including batteries, charge controllers and inverters. More and more states (Maryland is just one example) are offering subsidies or other incentives for adding storage capability to a home or business solar installation. That’s the good news. The bad news is that whenever a hot sales opportunity like this comes along, there are always some unqualified and unethical contractors taking advantage of it – and of customers, with poorly designed and poorly executed systems. It’s particularly true of solar systems with storage, which are substantially more complex then the simply plug-and-play kind with just optimizers and micro inverters. There’s only one sure way to avoid this issue, and that’s to check and choose your installer very, very carefully. In West Virginia, that’s problematic, because the Contractor Licensing Board has decided, in my opinion, that anyone with an electrician’s van and a few ladders is a qualified solar installer. For example, community organizing experience does not qualify any company to design and install any solar system, particularly a more complex system with storage. Some of the technically challenged commissioned salespeople in our region will tell you almost anything to make the sale (and the commission that goes with it). I know this to be true because we hear the stories – constantly. So check the installer’s licenses. Check their credentials, particularly NABCEP certifications. Check their references and previous installations. Don’t just ask for references, insist on them. And then make sure you talk to the buyers. You really don’t want to have on-the-job training taking place on your roof, at your expense (and peril). What kind of storage system should you get? While people tend to think of solar storage as if it were one kind of system, it’s actually three different ones – each with its own special uses, advantages and disadvantages. Bi-modal – Named that way because it can operate in either of two modes: as a grid-tied system or as an off-grid system, using its adjunct battery bank and associated electronics to take stored energy from the batteries whenever a grid outage occurs. The inverter takes DC electricity from the batteries, converts it to AC and energizes a critical loads panel throughout the outage. It’s a fully automated system that engages in microseconds – so quickly, our customers tell us, that they never have to reset their digital clocks. We’ve been installing bi-modal battery backup systems since 2009. Our systems are designed to give most homes three days plus of electricity without charging – running the well pump, refrigerator and freezers, lights, and the like, so you can life a very normal lifestyle. Three days plus is a conservative estimate, by the way; even on very cloudy days, you’ll still get some charging from the sun. In fact, we’ve had people go more than two weeks during extended outages with this system. Lithium-Ion batteries like LG, the Tesla PowerWall or the Solar Edge StorEdge may be newer, but they’re definitely not better for this backup-only configuration. If anyone tells you otherwise, ask them to get back to you when they understand the technology better. Consumptive Storage – With this configuration, the power grid and the solar array power your home or business by day and generate enough excess electricity to charge up the batteries so they can power key circuits at night. By cycling your batteries from full charge to flat every day, you significantly reduce their lifespan. This is true even for Lithium-Ion batteries, which are actually well suited to many cycles (as in electric cars). The inverter’s capacity limits the number of circuits you can use at night – no clothes drying, for example, no hair dryers, etc. This could lead to some strained conversations with family members. Consumptive storage just isn’t as good as net metering, which lets you transfer surplus power to the electric company’s grid and cut your monthly bills accordingly. In the US, we have net metering. In Europe, where electric rates are double to triple those here, and where they don’t have net metering, consumptive storage is very popular. If we ever lose net metering here, it will be Game On for consumptive storage, which we can easily convert our bi-modal installations to. But until that day comes, bi-modal solar with battery backup and net metering beat consumptive storage hands down. Off-Grid – Off-grid solar is really my favorite solar type and the most fun to design and deploy. But if you enjoy things like heat pumps, air conditioning, and all the other appliances we take for granted, it’s not the most fun to live with. Most of our off-grid systems are for vacation homes or hunting cabins. Only a few are for full-time residences, because for full-time residents, living off grid is a lifestyle choice and a commitment to stay within the system’s power limits. 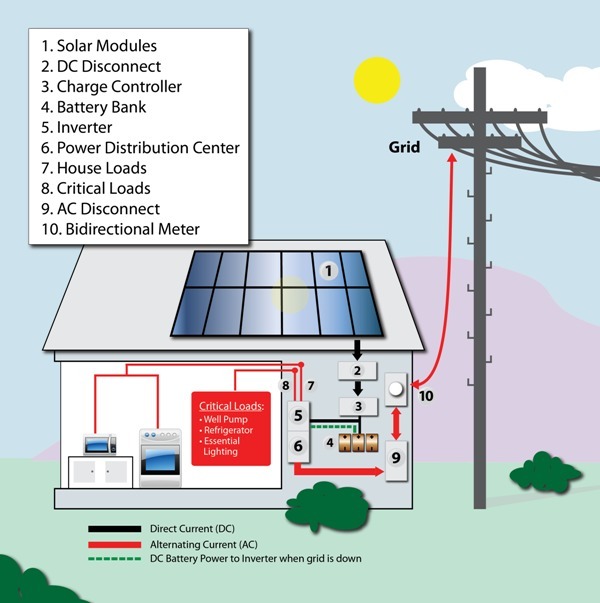 Installing a properly designed off-grid system requires a complete understanding of key factors like properly identified loads and selecting properly sized components such as inverter, charge controller, and solar array to meet those loads over many differing scenarios. A friend who works as an engineer in the solar industry says off-grid solar requires “balance.” The inverter, batteries, charge controllers and array all have to be in balance with the loads and complement each other. That’s a good way to describe it. In our area, very few installers really know off-grid solar and a few dabble in it – usually at the customer’s expense. A typical mistake is to try to cover their bases with a battery bank that’s much too large (and expensive) for the other components. As a result, the rest of the system doesn’t generate enough power to maintain the battery bank’s charge level, shortening the batteries’ lifespan. Once again, balance is key. As is choosing your installer carefully.